JOHN OTWAY, ‘Rock ‘n’ Roll’s Greatest Failure’, continues on the road for the rest of this year promoting his new album ‘Montserrat’. Renowned for his bizarre escapades and successful enduring career – despite self-confessed limited musical talent – John’s shows are always hugely entertaining whether with or without his remarkably good band of 20 years. His latest venture, a new album recorded on the Caribbean island of Montserrat, sees Otway in fine fettle delivering not only an excellent set of tracks but also an event no other rock star has achieved in 25+ years. Otway is the only international artist to have recorded on the island since 1989 when the Rolling Stones made ‘Steel Wheels’ there. Hurricanes and a live volcano having reduced half the island to a modern day Pompeii, the rock elite long since went elsewhere. But Otway was undeterred. Following in the illustrious steps of Dire Straits, Elton John, The Police, Status Quo and many others, he knew that Montserrat was still THE place to record. Along with half the island, however, Air Studios had fallen into dereliction so he created a studio in the basement of Sir George Martin’s house, flew in the producer from Canada, the band from the UK and the amps from Miami (even some fans flew out…). 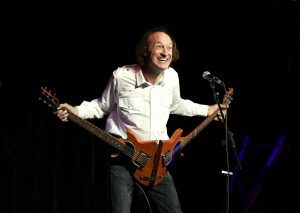 On completing the new album Otway donated some of his musical equipment to the islanders and future visitors to help sustain the live tradition of music. The new CD features 11 tracks in all (“10 are definitely hits” says Otway) and comes in vinyl, CD and special box set formats. Dates are as follows and ticket details are available from venues. For more information see www.johnotway.com.